Just imagine retirement in the beautiful Robson Valley. Away from the fast paced lifestyle of larger centres, you can immerse yourself in the quiet and beauty. The affordability of local real estate will allow you to realize your dream; whether that is a home on acreage, a single family dwelling, or dedicated Senior's housing. 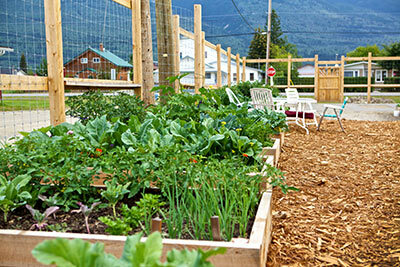 Sell that condo in Vancouver, buy a nice sized home and grow a backyard vegetable garden in a warm and welcoming community. If you don't have space for a garden in your back yard, but you likely will, you may want to engage in a local community garden. Area recreation centres offer sporting activities for people of any age or level of fitness and there are a myriad of organized activities for the young at heart senior. Once you are established here, you can stay in touch with your family and friends with high speed internet service. Active Seniors organizations will keep you busy with activities. Trips to Jasper or Prince Rupert are planned by using VIA Rail Service, and bus trips to Prince George for Christmas activities or Casino visits are common. Recreation Centres provides seniors rates to use the workout equipment or participate in carpet bowling.